New Septic Systems and replacement septic tanks in Massachusetts are being constructed with a filter device that is inserted into the Septic tank outlet tee. There is supposed to be a cover to the finished ground surface (the cover is bolted down to avoid unauthorized access). There are multiple companies that manufacture these outlet filter devices. These filter devices are typically the same and serve the same basic function, which is to help prevent solids from leaving the Septic Tank and entering the leaching system. A premature failing of the leaching system can occur when soilds and grease are allowed into the leaching system. 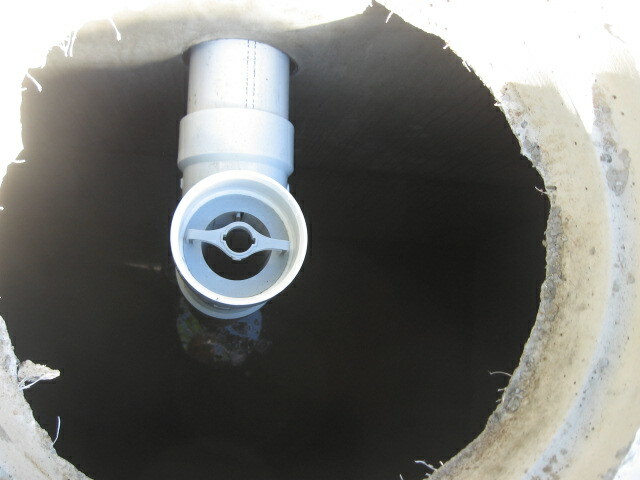 The filter is simply inserted into the outlet tee. This filter must be cleaned as part of your septic system maintenance. The Massachusetts Sanitary Code requires the installation of a manhole access cover extended to the final ground surface over the outlet of the Septic tank when an outlet filter is installed. This manhole cover eliminates the digging & searching for the Septic Tank outlet. For safety reasons, these manhole covers are bolted, so you will need a wrench to remove the bolts before opening the cover. The septic tank outlet filter should be cleaned at least once every year and when the septic tank is pumped. To clean the septic tank outlet filter, you will need rubber gloves, tools to open the manhole cover and a garden hose. WARNING: this maintenance work will expose you to sanitary waste, so if you have health issues, hire a sanitary pumping company to do this maintenance work. ALSO, do not touch your face or eye when you are doing this job. 1. Put on the heavy rubber gloves and un-bolt the manhole cover. Remover the cover. 2. Reach into the septic tankand grab the handle of the filter. 3. Pull the filter up and out, keeping it above the open septic tank. 4. Use the garden hose to spray wash teh scum off the filter and back into the Septic Tank. 5. Reinsert the filter back into the outlet. BE SURE to have the arrow pointing toward the direction of the outlet pipe. 6. Put the manhole cover back on (align the bolt holes) and tighten the bolts (don’t over tighten them!). Why do I need to clean the outlet filter? The Septic Tank outlet filter blocks material from flowing out of the tank and into the leaching system. Eventually the filter device will collect too much material and the filter will plug up with solids. When that happens, the effluent water is prevented from leaving the Septic tank. If the water can not leave the septic tank, it will back-up into the house. Depending on your home plumbing, a Septic Tank back-up could cause a nasty mess. My #1 Septic System maintenance Top —- Be sure to clean your Septic Tank Outlet Filter every year! How to backfill a Septic Tank with style! A bagpiper was asked by a funeral director to play at a graveside service for a homeless man. He had no family or friends, so the service was to be at a pauper’s cemetery in a remote location in the country. The bagpiper was not familiar with the area, and got lost. Being a typical man, he didn’t ask for directions. He finally arrived an hour late, and saw the funeral director was already gone, and the hearse was nowhere in sight. There were only the diggers and crew left, and they were eating lunch. The bagpiper felt badly and apologized to the men for being so late. He then went to the side of the grave and looked down and saw that the vault lid was already in place. Not knowing what else to do, the bagpiper started to play. The workers put down their lunches and began to gather around. He played out his heart and soul for this man with no family and friends. He played like he never played before for this homeless man. As he played his last song, Amazing Grace, the workers all began to weep. When the bagpiper finished, he packed up his bagpipes and started for his car with his head hung low and heart full of emotion. What qualities do you look for? You have finally decided that it is time to replace your old septic system. You have been told by the local Board of Health that you need to hire a Civil Engineer and a bunch of other stuff that you forgot as soon as you left the office. Your friends aren’t much help either. What are the qualities that you are going to look for as part of your decision to hire a civil engineer? Price? Reputation? Knowledge? Recommendation? Local Firm? Are you going to just hire a contractor and let him hire the engineer? oops! you may not want to do that, especially if you are concerned about the Price! There is a regional furniture store that has a marketing jingle, “Quality, comfort and price, that’s nice”? So tell me, what qualities do you look for? Having trouble with your Septic System? Can’t take a shower and run the washing machine at the same time without having to clean-up a system back-up? You have a nice wet green area in your yard when the rest of the lawn is brown? Do you think it is time to replace the old Septic System? Why not “do it yourself”? While some of the following information could apply to other States, the focus of this Blog is to address residential septic systems in Massachusetts. The first step is to understand what is a Septic System, which is also known as an on-site sanitary wastewater disposal system. The Massachusetts Department of Environmental Protection (MA DEP) maintains a website with lots of information. The trick is navigating through the site (link to the main DEP Septic System page) to find the answers you need. In Massachusetts, the design of septic systems is controlled by the State Sanitary Code (310 CMR 15.00) which is also known as Title 5 which can be obtained at this MA DEP Septic Systems/Title 5 link . Each community can also establish local regulations that have to be followed. You should check with the local Board of Health office. Before you get started using the Code to do the design, let’s become familiar with the basic septic system components. The effluent leaving the septic tank and/or pump chamber has to be piped to a Distribution Box (“D” Box) before entering the SAS. The Distribution Box is designed to allow the effluent to be distributed evenly into the leaching system by gravity (there are pressure dosed systems that do not use a “D” box). 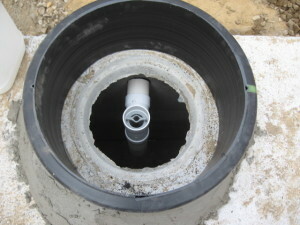 Distribution boxes are typically made of concrete and are available with multiple pipe openings and sizes. The SAS or “leaching area” allows the distributed effluent to pass into the ground. There are multiple types of systems and components that have been approved for general use in the design of this system component. The decision to use a pipe and stone leaching field, pipe and stone leaching trench, chamber system or other type of system should be based on the specific site conditions and property constraints. The MA DEP web site also published a series of technical design documents that are available at this Guidance and Policy link. Now that you are more familiar with the systems components and have copies of the regulations, there are a few more steps that need to be accomplished before you can work on the design. You will need to prepare a plan of your property to show the existing house as well as the site features, such as the driveway, trees, swimming pool, etc. This plan needs to show your property line (your deed will describe your property and may even reference a plan that shows your lot lines). This plan also needs to show topography (your town may require the topography to be based on a national datum and not an assumed elevation) and spot elevations at certain locations. It is also helpful to know the location and invert elevation of the building sewer pipe at foundation as well as the location of your water service and other utilities (gas, electric, CATV). If you or your neighbors have a well (drinking water and or irrigation well), then they (all the wells) also need to be located and shown on the plan. Do you have wetlands within 100 feet of your property or where the new septic system would be installed? Then you will need to have the edge of the wetlands determined, located and shown on the plan. Some towns have local Wetlands By-laws & Regulations which are more stringent that the State Regulations, so it may be best to contact your local Conservation Commission office. Now that you have your worksheet plan, you can determine what area is available to locate the new septic system. The Code has a list of set-back distances that need to be followed, such as 10 ft. off the property line, etc. The next step will require the services of a MA licensed Soil Evaluator to perform the official soil evaluation and percolation testing. This testing is witnessed by the local Board of Health and typically involves submitting an application along with a fee payment. The testing will involve the excavation of several deep (10 ft. plus) holes in the proposed system location, so you will need a larger backhoe. You (or your excavating contractor) will need to obtain a “dig-safe” number and a Trench Permit (issued by the town). The soil evaluation will determine the depth and suitability of the soil, the elevation of the estimated seasonal high groundwater and the percolation rate. These items are all used in determining the elevation of the system components as well as the size of the SAS. If you have a property that has high groundwater and the good soils are saturated (can’t perform the percolation test), then a soil sample can be taken to a State Certified Soils Lab to perform an analysis to determine the classification for establishing a percolation rate. This is only allowed for system replacement when no increase in flow is proposed. Speaking of flow, the Code requires you to use a design flow based on the total number of bedrooms. If you have a house with more than 10 rooms, you are required to do a mathematical calculation to arrive at the bedroom count. The Code uses 110 gallons per day per bedroom with a three bedroom minimum design. Some towns require a higher design flow amount. Now you can take all of this information and do the design for your septic system! The Code has a listing of all the items that must be presented on the design plan and some towns have additional content requirements. In Massachusetts, the final design plans that are submitted to the Board of Health for approval must be prepared by a Registered Sanitarian or a Registered Professional Engineer. Maybe the “do-it-yourself” method is not a good idea. However, by knowing what is involved with this process and the multiple options for replacing a failed septic system, you can use this knowledge in hiring the Sanitarian or Professional Engineer who will work closely with you in preparing a final plan that is best suited for your property. Septic Systems – What your Real Estate Agent should know! By Michael E. Perrault, P.E. How long has your house been on the market? That is a very common question, especially during this “economic slow down”. Are you using a Real Estate firm to help you market and sell your property? What are you doing about your old Septic System? If you have a septic system and live in Massachusetts, you are obligated by law to have your septic system inspected when you are selling your property. Before 1995 this requirement did not exist and typically only a token observation was performed. Opening the cover of the Septic Tank and proclaiming, “looks good to me” does not constitute a thorough inspection. With the changes in the Massachusetts Sanitary Code since 1995, a licensed septic system inspector must follow the Title 5 Code requirements and document the inspection using the standard State forms. A copy of this completed form must be submitted to the local Board of Health office, the seller and a copy must also be provided to the buyer. When you lsited your property, did your Real Estate Agent tell you about the need for the septic inspection? Did you have it done right away or are you waiting for a buyer? Over the last 18 months I have been travelling to various real estate offices in Southeastern Massachusetts and presenting a brief seminar on septic systems. This seminar was pre-arranged to be made during the monthy meeting of the brokers, agents and sales staff and would take about 1/2 hour. The focus of the presentation was on the need for the inspection of the septic system early in the sales process and what to do when the inspection results in a failure. My advice is to have the work done sooner than latter. What makes one property more attractive than a very similar property in the same neighborhood? If both houses needed to have their septic systems replaced and one had all the engineering design completed and plans available for the buyer to review, would that make one house more attractive to a potential buyer? Showing of the property would include telling the potential buyer exactly where the new septic system would be going and if it would involve building a large “hump: in the yard. What if the house had the system installed and the lawn restored. Would the completion of the work make that house even more attractive? The showing would simply indicate the location of the installed system and that there would be no delays due to the need to install a new septic system. Some property owners simply do not have the money to pay for the design and installation of a new septic system. My advice is to suggest, as a minimum, getting the soil testing and desgin engineering completed as soom as possible. Once the design plans are completed, the owner can obtain actual construction cost estimates. The cost for replacing the septic system will play an important roll in establishing the acceptable price for the property. As for the installation of the system, Banks and Mortgage Companies typically do not want to hold back funds at the “closing” to pay for the installation of the septic system. When they do agree to holding back the money to build the system, the amount is typically 1.5 times the bid estimate. There are contractors that will work with sellers to install the replacement septic system when the sale documents are complete and the “closing” has been scheduled, pending the installation of the septic system. These contractors are typically listed on the “closing documents” and are paid from the funds generated by the sale of the property. Not all real estate professionals know about these options, have the contacts to get the engineering completed in a timely manner, obtain legitimate construction quotes or arrange for the “pre-closing” construction. I hope that my “septic system seminar” for real estate professionals provided a little more knowledge. One other “tool” that was provided to these professionals was a copy of the brochure “Valuable Information on Title 5 Septic System, Perc. Testing, Soil Evaluation and Design Engineering”. This brochure clearly outlines the steps that need to be followed in replacing a faied septic system. This brochure can be downloaded for free from the www.pmpassoc.com web site landing page. Why do you need to hire a Professional Civil Engineer to design a Septic System? Everyone wants to save money. A recent “Close to Home Cartoon by John McPherson caught my attention. When it comes to a failed Septic System, you need to get professional help. While the man who runs the pumping truck has working experience regarding the “contents” of a septic tank, unless he is a Registered Sanitarian or a Civil Engineer, he is not qualified to prepare a septic system repair design in most States. Soil Evaluation & Design Engineering” by Michael E. Perrault, P.E. This pamphlet was specifically designed as a checklist to assist you, as a property owner, in the steps needed to have a replacement septic system designed, etc. What a long cold winter! The snow is finally melting and I can actually see some lawns. How do you know that Spring is near? The Red Sox are in Ft. Myers? The St. Patrick’s Day decorations are available in CVS & Walgreens? The pot-holes in the street in front of your house resemble the Grand Canyon? I know that Spring is near when septic system contractors start constructing replacement septic systems. All those designs that were completed before the ice-age hit last December became “shovel ready” over Winter. Homeowners living with a failed septic system just want to get it fixed so the yard will be normal come Summer. The same applies for those people trying to sell their homes. They want to get the new septic system installed and the yard restored thereby eliminating last minute construction before the closing. Just this week construction started on one of our septic system repair design projects. The septic installer coordinated the construction with our office and the Board of Health to confirm that we would be available to perform the multiple construction phase tasks. For example, once the excavation is completed, the design engineer has to visit the construction site to observe and confirm that the unsuitable soils have been removed and that the excavated hole is ready to be backfilled with sand. The Health Agent also performs his own observations as the work progresses. The contractor had already installed the new 1,500 gallon septic tank and 1,000 gallon pump chamber in order to provide a temporary holding storage while the replacement system was being constructed. Once the sand had been placed, the septic contractor installed the leaching chambers, distribution box and connecting pipes. Since this system will use gravity flow from the distribution box with a pump chamber to lift the septic tank effluent to the distribution box elevation, the distribution box and the chambers are designed with vent pipes. To help reduce the overall construction cost, our design used a chamber system that does not require any washed stone according to the State approval documents. The completed leaching area is also covered by a geotextile filter fabric. The State Sanitary Code requires the design engineer to observe this construction, make sufficient measurements to confirm that the components were properly installed and then prepare a plan showing the constructed system (This is called the “as-built” plan). The as-built plan is submitted to the Board of Health with a letter signed by the professional engineer, which states that the system has been installed in accordance with the approved plan. Now that I have proof that Spring is near, what proof do you need? How about some good news? The cost of replacing a failed septic system is low. The slow down in construction has increased competition and reduced the costs. So now may be the best time to get that failed septic system replaced. Is there bad news? Yes, be sure to investigate the qualifications and reputation of the “lowest price” contractor and carefully read the contract for items that are not included.